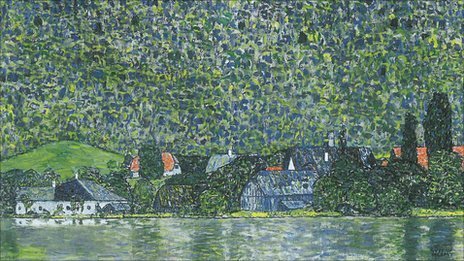 A 1915 Gustav Klimt landscape, looted by the Nazis and recently returned to the owner's grandson, has sold for $40.4m (£25.4m) at a New York auction. Litzlberg on the Attersee was returned to Georges Jorisch, 83, by Salzburg's Museum of Modern Arts in July. Other highlights of the Sotheby's impressionist and modern art sale included Picasso oil painting L'Aubade, which sold for $23m (£14.5m). David Norman, of Sotheby's, said the market had "really roared back". Litzlberg on the Attersee, a painting of a lake in western Austria, was originally owned by Austrian iron magnate Viktor Zuckerkandl before being passed on to his sister, Amalie Redlich, when he died in 1927. She was deported in 1941 and never heard of again. Her art collection was seized by the Nazis and sold off. Auction records were set for French impressionist Gustave Caillebotte, whose Le pont d'Argenteuil et la Seine fetched $9.3m (£5.8m), and Russian-born Art Deco painter Tamara de Lempicka, whose Le reve (Rafaela sur fond vert) sold for $8.5m (£5.3m). Henri Matisse bronze Nu de dos, expected to be a highlight of the auction, was withdrawn after it was sold privately on Tuesday for an undisclosed sum, together with three other works in the series. Sotheby's had intended to sell them separately over the year for up to $30m (£18.9m) each. Wednesday's auction fetched an impressive $200m (£125.6m) with 57 of 70 lots sold. Mr Norman, Sotheby's head of impressionist and modern art, said: "There's just tremendous strength coming from all over the world." It followed a poor night for rival Christie's on Tuesday when a number of top lots - including a Degas sculpture of a teenage dancer - failed to find buyers. Less than two-thirds of the 82 works were sold.